Slitter Rewinder Video(FSL-T Superior) - HCI Converting Equipment Co., Ltd. The T Series Slitter Rewinder is designed for slitting all types of flexible packaging films, photonics and optical materials. Such as cellophane, PET, OPP, CPP, PE, PVC, paper rolls, counterfeit-proof labels. 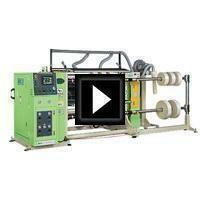 The HCI FSL-T Series is a universal Slitter Rewinder on the market.